And while it is more common for our northern Appalachian friends and kin to lean on the hard ‘a’ sound in our region’s name, for other mountain folk that version only causes annoyance. 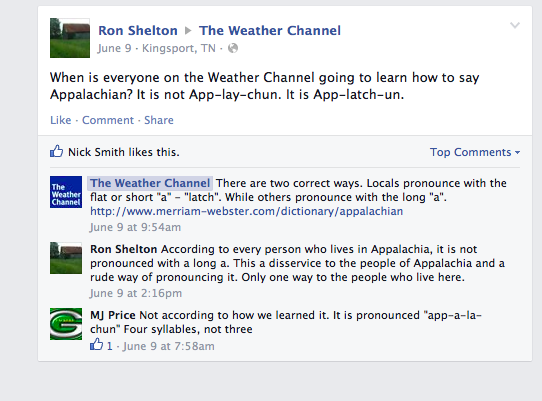 Such as Weather Channel viewer Ron Shelton, as seen in this Facebook post captured below, where he questions the network’s corporately-consistent pronunciation. But that does not deter the Weather Channel who replies not-so-nicely (did an intern post that reply? ), and points out that “locals” say it one way (App-uh-latch-un) and others can say it any dang way they please. So go local. Go App-uh-latch-un. At least that’s the motivation behind this pronunciation t-shirt by filmmaker and West Virginia native Elaine Sheldon, who during a screening tour of her interactive documentary “Hollow” encountered the pronunciation divide between herself and viewers from Vermont to Amsterdam. While presenting the film, Sheldon would say App-uh-latch-un. “But during the Q&A portions,” she says, “people would often revert to App-a-lay-shu. … When the national and international media—sometimes [it is] people’s only contact with Appalachia—refers to the region they often pronounce it with the ‘lay-shu’ instead of ‘atch-uh.’” Thanks, Weather Channel. Sheldon says, “a couple weeks ago .. a lightbulb went off: ‘I should just make a t-shirt that politely makes people sound it out,’ I said.” Now she has a box of 100 t-shirts that read [app-uh-latch-uh]. They are printed by Commonwealth Press in Appalachia’s own Pittsburgh on American Apparel tees. They are $20 each and can be ordered online. She also had so much interest in the first 24 hours that she’s taking orders for the next printing. She acknowledges that “there are people within Appalachia that say it the other way, but for me and many others there is only one, right, way to say it.” So, Ron Shelton of Facebook, maybe you can buy one of these for your favorite Weather Channel personality to wear on air. Learn more about Elaine Sheldon at elainemcsheldon.com. Photo courtesy of Elaine Sheldon.